The Scottish Chapbooks Project at the University of Guelph is a collaboration between the Library’s Archival & Special Collections and the Department of History. 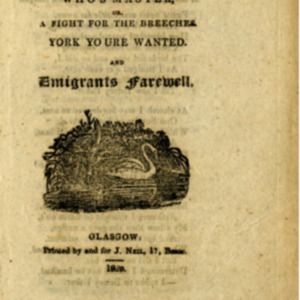 The purpose of this project is to make the library’s collection of Scottish chapbooks – one of the largest in North America – accessible to historians and to digital humanities students. The Project is generously supported by the Scottish Studies Foundation and the Jane Grier Family Fund. Learn more about the Chapbooks Project. Chapbooks were pamphlets of eight to twenty-four pages that were created and sold in the 18th and 19th centuries. They featured popular stories of romance, travel, comedy, politics, fairy tales, religion, social customs, and history. Chapbooks were cheap (hence the name ch(e)apbook) and served a market for reading material. They were particularly popular in Scotland, where the songs, ballads, poems, and short stories appealed to a population that was highly literate by European standards. Over time these cheap books faded from the public sphere as a result of alternative reading materials, mainly newspapers and periodicals. From the outset, the students of History 4170 (Exploring Digital Humanities) have used the chapbooks project as a sandbox to learn about and use digital tools as media to convey historical research and information. Under the direction of instructor Andrew Ross and Special Collections Librarian Melissa McAfee, students have created digital exhibits and teaching modules using chapbooks.